Magento is the market-leading opensource framework. Magento offers high quality modern online stores in which all your business logic is met. If you are thinking about taking the leap to ecommerce or your current online store does not meet your needs, Magento is the solution you are looking for. Do not hesitate! Make a qualitative leap to Magento and make the most of all the possibilities it offers. Have a modern and dynamic online store in which you can lay the foundations for a thriving and profitable business. Magento is the market-leading framework. The perfetct solution for your online business. If you are thinking about setting up an online store or improving your current one, the choice of the framework in which relay on your business logic is an important decision. Choosing and adaptable and scalable framework is crucial. Way2 Ecommerce, experts in strategy and ecommerce consultancy, undoubtedly opts for Magento. 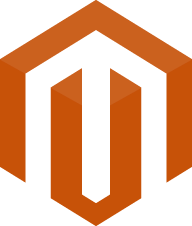 Magento is an opensource ecommerce platform with advanced functionalities in which main brands in the world rely on. Magento is owned by Ebay and there is a great community backing it which guarantees support and future updates. Get a modern online store with future potential in which lay the foundations of a thriving and scalable online business. Magento is the framework used by the cutting edge ecommerce companies. Magento is the market-leading ecommerce platform, spanning a great percentage of all the online stores in Alexa’s Top 1M. Its background and continous growth make Magento the perfect solution on which develop, boost and modernise your online business models. 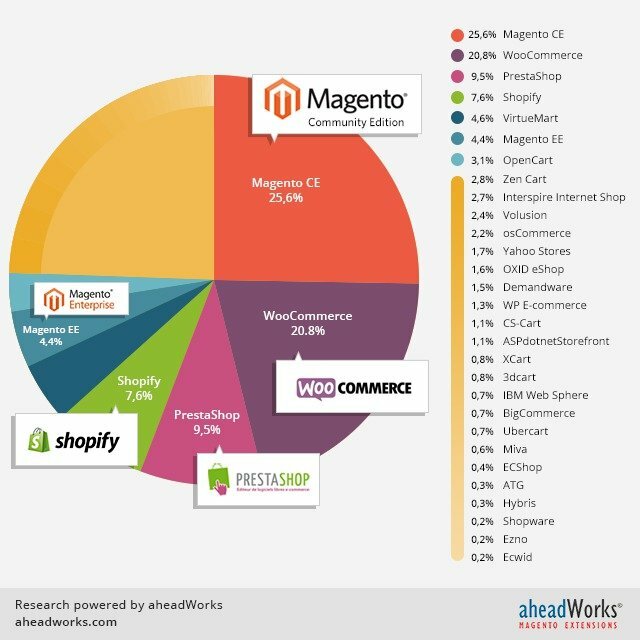 The following graphic, from Aheadworks, depicts the use of the different ecommerce platforms. As you may see, Magento ecommerce, Community and Enterprise editions, is the undisputed leader. If you are still doubtful about Magento, here you can find an overview of its main advantages. Magento offers a large amount of free and not free extensions to easily boost your ecommerce. With a large community and a marketplace, Magento makes the improvement and update of your online store an easy process. The experience of Way2 Ecommerce in strategy and ecommerce consultancy will help you make the most of the best extensions and optimizations to increase sales and conversions. Magento is an opensource platform, therefore it is totally adaptable and user adjustable. If none of the modules meet the needs of your business model, our consultants will analyse your demmands and our expert Magento developers will create a customised module that meets your requirements. Our background in ecommerce guarantees that all your needs can be feasible regardless of the existence or not of turnkey extensions. Way2 Ecommerce is an experienced company with background in integrating and connecting Magento with different ERP’s. Insert your prices, fees, products, customers and any other information in your ERP and let Magento transfer it to the web and vice versa. This automation process reduces a big deal your daily management tasks and helps you concentrate in the core aspects of your business. If you are thinking about taking the leap to new markets, Magento is the opensource ecommerce platform you need. Magento lets you manage several stores on the same admin panel. Get to your potential market and manage all your products, fees, sales, payment methods, etc, from the same admin panel. Concentrate all you online stores in a single admin panel from where manage all of them and reach all your customers regardless of their localization. Magento is a SEO friendly framework made to facilitate Google and the main search engines easily find your products and contents. Its multiple configuration options on products, categories and static content are a perfect tool to enhance SEO results and make your online store stand out among the competitors. Let your customers easily find you to increase your sales online. Magento is easy to integrate with social networks and marketing tools. It inserts social networks on your product page so the customers can easily share them on sites like Facebook, Twitter, Google+, Pinterest, etc. Besides, main marketing tools are available in Magento marketplace and ready to be integrated in your online store to help you encourage and increase purchases as well as promote customer loyalty. Magento is ready for the main payment methods. Easily add Credit Card payment, Paypal, bank transfer or cash on delivery in your store. Magento is also ready to allow different shipping methods. Moreover, main courier companies have developed its own free extensions to help you integrate them with Magento. Integrate several shipping methods in your online store even in multisite projects. Magento has several product types built in. Our ecommerce consultancy service will help you decide the ones that better suit your business model. Product layout must be optimised to increase sales and enhance usability depending on product type. Make it simple to your customers to get better user experience and increase conversions.